Who owns Red Eyed Tree Frog? You made a San Francisco sailing mag. That's a frequent visitor / poster to this site HAMMOND, triple trapezing on his H20 at the New Years Day Race this year in San Diego. Hey Hammond, I have the same sail as you! I don't see many of the 'jammin' sail. I have sail 785. Triple trapping, looks crazy. I sailed really poorly (see the results) but I had the most fun at this race that I have had in years. 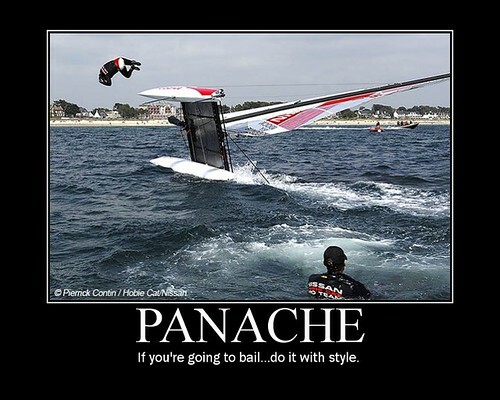 Good winds, two newbie crew, a new never been flown spinnaker, several close calls with big (60'+) boats (I was on Port). The coolest part was this; Michelle and Kaylee were jibing the jib and spinnaker without any guidance by the leward mark. Both were on and off the wire fast, even when we had to slam tack for a big starboard tacker none of us saw. The girls screamed when we; hit waves, flew a hull, dropped a hull, got splashed, stayed dry, luffed a sail, tacked, jibed... It was an hour and a half of constant 6th grade girl screams! Near the finish of the race, we caught and passed one of the Hobie Tigers. We had a poor start, first leg, spinnaker run, and a slow begining of the beat back. But then the wind built enough for us all to be on the wire, and we were marching on the other boats. I was shocked when we passed this Tiger as he out sailed us the entire race. He held his lead even after capsizing at the leeward mark. (I told you I was slow, even capsized boats were faster than us). Here are a few links to pictures near the end of the race. hey what kind of snuffer system are you using? 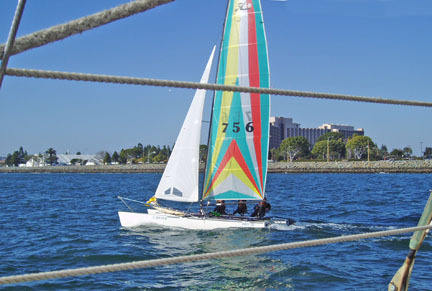 I am using an experimental model developed by Point Sails in San Diego. It is light and soft but not yet ready for the public. With one or two tweeks, it will work really good. It hooks directly to the bridle wire. I think a hard material covering the bridle wire may make the sail dousing easier. Chip and I talked about a PVC sleeve to make the knots in the halyard/douse line slide more easy.He may have the final version now. Hobie may offer this, Matt Miller would know better. I am using an old Ampro aluminum windsurfing mast donated by a friend, and other assorted hardware to make it all work. It is not as clean a system as Hobie sells. Take a look at the factory pole and hardware as it will save you time and probably money. I guess I could take a few pictures of the rig up close if anyone needs hardware mounting ideas. It is a lesson in making what you have in the garage work. One other note, I used the shroud anchors as a turning block attachment point, but one of the Tiger guys tells me that the new hot setup is using the end of the crossbar as the turning block point. I had detached the barberhauler to get rid of a few lines and hooked it to the spinnaker sheet as a tweeker, but after looking at the sail, I decided to return to the shroud. we bought a spinnaker and pole (both factory) for our H20 and are thinking about getting a snuffer but can't decide on which one to get. perhaps we can just pick up an old tiger one. should fit, right? Yes on fitting and working. The factory Tiger snuffer is Greg and Jaques tested, improved and approved. Until I make my own and have the factory market it , the Tiger model is the best out there. we want to outfit our spin for a snuffer system. do you know if we can put our retreiver patches in the same location as those found on the tiger sails? (i found a nice diagram from hobie australia that shows the locations for the tiger and FX spins, but i can't seem to find one for an H20 spin). The head and the clew of the spinnaker should be at the openning. The bottom dowsing hole snugs up to the back of the bag. The next two I like to be able to separate by a few inches. If you can then take 6 inches as an example Then measure 12 inches from the head that is 6 X 2. Then the middle hole will be 3 inches closer to top hole than the bottom hole. This separation (of 6 ' from each dowse point) keeps the spin from bunching as it goes onto the snuffer. You will not be able to separate the dowsing holes if the bag is not long enough. Did you ever get the pictures posted? I am pretty sure I have most of the parts. I have two poles and a fairly well made / home made snuffer bag, a spinnaker, lots of line, and some time. See my post "More Questions and Comments"
I would love pictures and advice, I want to get my spin rigged badly. You can also email to cjacosta "at" yahoo "dot" com.